Please provide name and email address and we will send you product information. I would like more information on: (Safety Data Sheet), (Organic), (Where to Buy), etc. All-natural. It’s worry free. No discarded milk. More milk in the tank. Fast acting and versatile. It works. Try it! 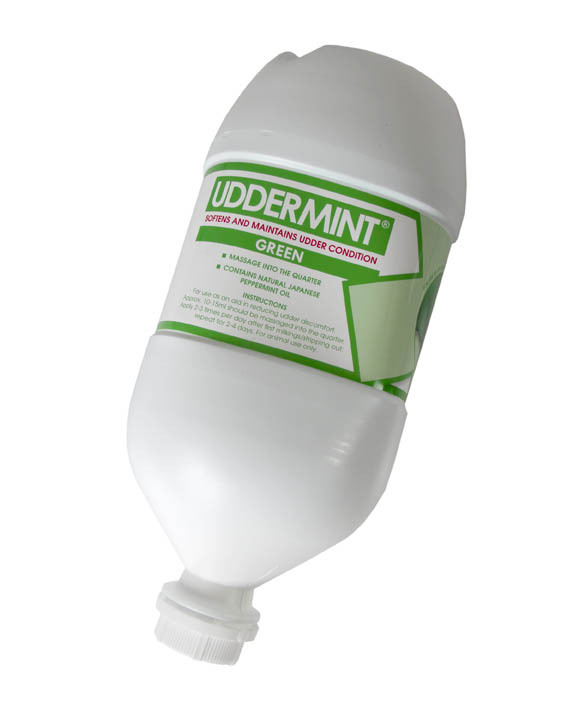 Keep your cows udders in mint condition with Uddermint, the best udder conditioning product on the market. 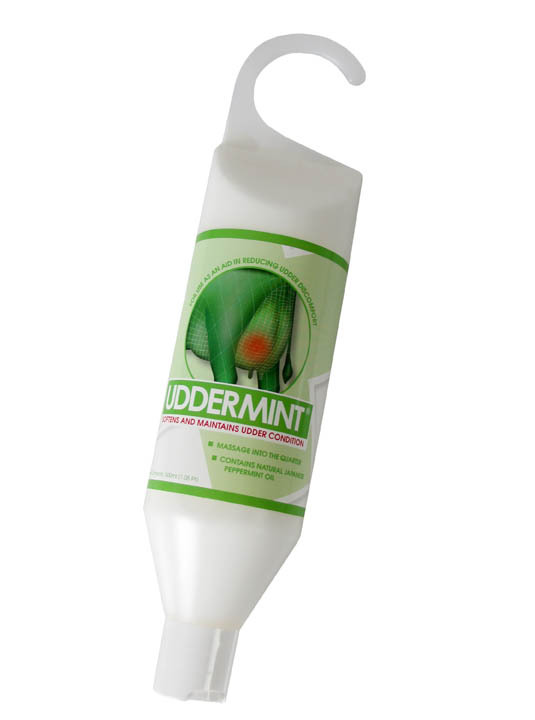 Uddermint improves udder health as it soothes and clears. The principal ingredient is Pure Japanese Peppermint Oil – refined, an all-natural product. It’s so concentrated and fast acting that you’ll notice results within 12 to 24 hours after rubbing it on; yet so mild that it is safe and worry free. Hundreds of North American dairy producers are already using this elite product and are extremely satisfied. Producers view Uddermint as an effective way to sometimes avoid the use of antibiotics and thus eliminate withdrawal time. Application: Rub about 10cc of the cream into the udder after milking. Reapply for 2 to 3 consecutive milkings. Do not rub into open wounds or the teat end. Shipping costs determined by quantity ordered and method of shipment. Uddermint is a registered trademark of Teisen Products, Ltd., Redditch, U.K. All claims, representations and warranties, expressed or implied, are made only by Teisen Products, Ltd., and not by All West/Select Sires. Uddermint es un linimento natural con el ingrediente activo CAI-PAN, aciete puro de menta. El producto es producido en Europa y se ha usado con exito por ganaderos lecheros por mas de 25 anos. Ya que Uddermint no contiene antibioticos, no hay problemas de residuo en la leche o la carne y no se necesita desechar leche. Uddermint se usa como ayuda para mantener las ubres saludables al estimular o activar el mecanismo de autodefensa y asi ayudar a tranquilizar y aclarar. Lecherias a traves del pais declaran que Uddermint es efectivo para reducir inflamación y promueve relajamiento, al mismo tiempo tranquilizando las ubres infectadas. Uddermint es popular para vacas recientemente ordeñadas y se puede usar con, o sin antibiõticos. Masage l0 cc (tamaño de una peseta) de crema Uddermint a la parte afectada por 30-60 segundos. Apliquese 2-3 veces al dia, por 2-3 dias. Los resultados e podran ver despues de 1-2 aplicaciones. Uddermint no se recomienda para uso en las tetillas o en heridas abiertas. Si tiene problemas de heridas abiertas en sus manos, el uso de guantes nitril se recomienda. ¿Hay otros usos para Uddermint? Uddermint no solamente es específica para una especie, el uso es efectivo en otras especies para reducir la inf1amacön. Uddermint, ademas, se puede untar al corbejon y en otras coyunturas. Un tubo de 500ml de Udderrnint proveera aproximadamente 40 aplicaciones a un costa de 60-70 centavos por aplicacion.